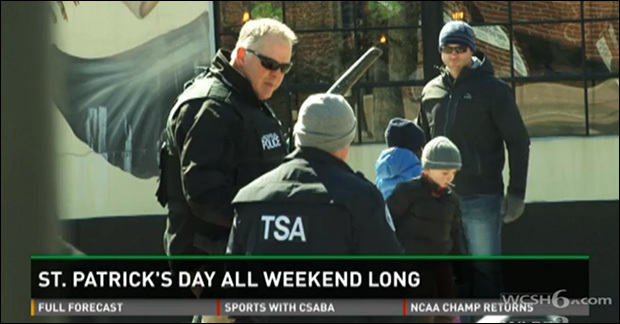 A St. Patrick’s Day celebration and parade this past weekend in Portland, Maine, boasted a high turnout, and one notable attendee was the Department of Homeland Security. 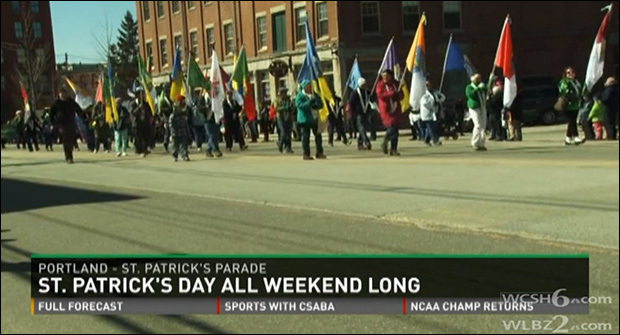 The Transportation Security Administration, having long ago shed the “transportation” part of its resumé, was “visibly guarding the parade route,” according to WCSH. The report doesn’t include explanation as to why TSA officers were policing the event, nor does it say how many officers there were or whether the agents were conducting checkpoints or airport-style patdowns, but their presence again highlights a marked departure from transportation-related endeavors – as their title would imply – and into the everyday mundane lives of normal citizens. A constant TSA police presence serves not only to overwhelm citizens, but provides the muscle to maintain faux control over situations. It also indoctrinates us as a society to accept this form of overboard policing as normal and conditions citizens to expect guilty until proven innocent treatment wherever traveled. Unfortunately, if you thought you could avoid the blue rubber glove grasp of the TSA by avoiding airports altogether, you’ve got another thing coming.